This week’s TJGT Alumni Spotlight highlights April McCoy of Carrollton, Texas. McCoy is a TJGT alumni veteran. The TJGT staff became very familiar with her smiling face and enjoyed the company of her dedicated parents, Darren and Toni, at each event. From a young age, April’s father instilled in her the importance of hard work in order to achieve her dreams. In a 2010 interview with the Little Elm Journal, Darren McCoy said, “She is a great golf player through dedication and hard work…..My daughter would practice 10 to 12 hours a day in the summer. I knew she was going to be good, but not this good.” Her mother Toni was her biggest fan and one of the friendliest faces to ever grace the TJGT events. During her junior career, McCoy was a member of the Carrollton Creekview High School girls golf team. She competed in District, Regional and State tournaments respectively throughout her junior career. Her most impressive finish came in 2010 when she tied for fifth place at the 5A Texas State Championship. Outside of high school golf, McCoy helped won numerous TJGT events. In the 2010-2011 season alone, she captured two majors: the Thanksgiving Classic and the Barton Creek Holiday Classic. In the 2011 TJGT Tour Championship and Aggie Invitational that year, she placed fourth. Her wild success caught the attention of collegiate recruiters all over the United States. Coming out of high school, McCoy was the No. 31 female golf recruit in the nation. When it came time to choose her future collegiate team, McCoy had her sights set on Texas Christian University in Fort Worth, Texas. 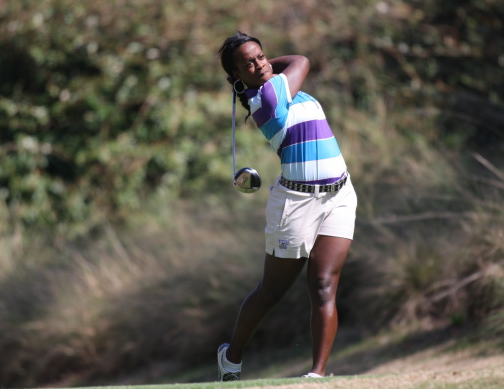 She would eventually accept a full scholarship to compete on the TCU Women’s golf team and also made history becoming the first African-American woman to do so. Her success didn’t stop once McCoy reached college. In her Freshman season, she was named to the All-Mountain West team, garnered three Top 20 finishes and ranked third on the TCU team in stroke average. After April had proved herself during her opening season, she capitalized on that success in her sophomore season. The greatest highlight during her collegiate career was during her sophomore year when she captured the the Windy City Collegiate Classic title posting scores of 73, 72 and 69. Her third round score was a career best. Later in the season, she finished tied for 22nd in the Big 12 Championship and went on to compete in the NCAA Central Regional tournament. During her junior and senior collegiate season, McCoy competed in numerous tournaments Her best finish during her final seasons came again in Chicago at the Windy City Collegiate Classic. She posted an impressive three day total of 220 and was TCU’s top finisher for the event. April and her loving family continue to be deeply involved with the DFW community through volunteer work. Her father has spoken at TJGT events to encourage juniors to never give up on their dreams and his daughter April is a perfect example.